Archives of Eaton Bray News for May 2007. A Christian Aid Concert by pupils of Edlesborough School and St Mary's Church young musicians - at St Mary's at 7.00pm on Wednesday 6 June. Please give this event - and the young performers - your support. The Friends of St Mary's are promoting a celebrity Organ Recital by Ian Tracey, Organist of Liverpool (Anglican) Cathedral on Saturday (2nd June) at 7.30pm in St Mary's, Eaton Bray. His programme will be a popular one, but we can expect a virtuoso performance - one not to be missed. Tickets will be £7 including wine and nibbles. Make sure you are part of this important occasion. Eaton Bray Lower School will be hosting a special day of sports coaching for youngsters next week. Football and other sports will be on the menu for kids aged from four to 12 on Thursday May 31. Professional sports coaches provided by Premier Sport will be on hand to offer top tips for sporty youngsters. For more information go to www.premiersport.org. More than £200,000 has already been spent on stonework and the roof of the historic St Mary's Church. A similar sum is needed to finish off the roof and restore the building's Victorian floor tiles. Peter Bennett, of the St Mary's stewardship committee, said generations of local people had been responsible for the upkeep of the 800-year-old building and it was vital that it continued. "In the 21st century, it is no less difficult than it was in the 15th century to find the money needed to carry out essential repairs," he said. The Friends of St Mary's are now hoping that local people will join them in raising funds to preserve an important part of the area's heritage. Canon Malcolm Grant, the vicar of St Mary's, warmly welcomed the new venture. He said: "We hope to create a network of Friends who will help to preserve this beautiful and historic church which has been at the centre of the community for 800 years." Anyone wishing to help the campaign should contact The Friends. Fanciful reports of wild beasts stalking villages (allegedly) tend to surface during the quiet summer months. But a giant ant really did invade Eaton Bray the other week. And as you can see on this page, we even snapped a picture of it. 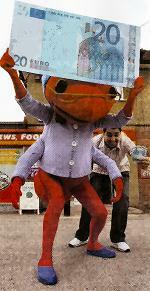 Don't worry - it was only the Post Office's Giant Ant costumed character. It dropped in at Eaton Bray Post Office, in the High Street, to launch a new service. What was it all about? Well, the village post office is now making it easier for people to pick up their holiday cash, by offering on-demand currency services. The Post Office says that people can now walk in off the street and pick up their euros, with no fuss, no hassle and no wait. A motorcyclist suffered leg injuries in Eaton Bray on Sunday. The male rider was taken to the Luton & Dunstable Hospital after the crash. A Range Rover was also involved in the accident, shortly after 12.30pm in The Rye at the junction with Totternhoe Road. Rogation Days are the three days preceding Ascension Day. Ascension Day commemorates the visible rising of Jesus Christ to heaven; and they all occur in this month; 17th - 18th - 19th and Sunday 20th of May. On rogation days the Roman Catholic Church sung or recited special litanies, to invoke a blessing on the years growing crops; some church's congregations would undertake a farm walk, with the Clergy blessing the fields and animals as they went. Rogation: The farmer and his workers did "farm walking" every day, summer and winter. A popular image in the past was of the farmer leaning on a gate staring at his fields, with a faithful dog sitting beside him. The atmosphere sedate and noticeably quiet! But May is an 'outdoor workday' month for those on farms, (apart from milking and sheep shearing); it is said that unless weeds are killed off in May they will never be properly subdued all summer. Grass means that livestock can live outdoors night and day. Growth of everything is rapid at this season of the year, and lighter evenings make for longer working days. for that is where my happiness is found." "And did those feet in ancient time, walk upon England's mountains green ? And was the Holy Lamb of God on England's pleasant pastures seen ? " William Blake thought it well within the bounds of possibility. When Jesus died on the cross and rose from the dead His presence filled the whole world. Set free from the limitations of being a human being, His Spirit pervaded the whole earth from that day to this. Well, we're having another good year with the 1st Eaton Bray and Edlesborough Scout Group. It's great to see the group thriving. Unfortunately we have waiting lists for each section, but this is a reflection of how well things are going. Thanks to those on the list for their patience. Erika in Beavers, Nick in Cubs and Tony in Scouts have been working hard for many years to get us to this stage and we'd love to carry this on for a lot more years. This is where you can help. Every 5 years or so, things come to a grinding halt in some sections and this is where we are with Scouts at present. Tony left recently and consequently the Scout group is without a leader. The parent rota has been very successful and certainly taken a lot of the strain off Nick who has stepped in as temporary leader in addition to running Cubs, but we do need a new regular Scout leader to step in. Obviously, anyone stepping forward would receive a lot of support from the other members of the troop and committee so please consider helping. It's a lot more difficult starting the sections off from scratch; much easier to continue the flow, so please do come forward if you are able to commit to regular assistance in Scouts. All those involved at present have found the experience very rewarding at many levels. We would really appreciate a response to this advert if you are able to offer any help. Please speak directly to Nick Evans at the Scout hut (Cubs - Tuesdays & Scouts - Fridays) or give me (Dave Jones 221489) a ring to chat through what it involves. We'd love to hear from you. It's official - the Chiltern FM Black Thunder is coming to Eaton Bray!! After months of secret negotiations, wheeling and dealing, ducking and diving, I can reveal that the famous Thunder complete with crew of two from Chiltern FM will be joining us for a couple of hours at our Play Tennis Day at the School Lane courts on Saturday 16th June. From midday they'll be handing out freebies and joining in with the various tennis activities, whilst playing all our favourite tracks of the moment, hopefully something for everyone. Together with the free playing and coaching, games, competitions, equipment and clothing sale, BBQ, local MP Andrew Selous and half price membership for anyone joining on the day, it promises to be a day to remember, so do come up and join us and meet the Chiltern Black Thunder crew! Talking of days to remember, our recent Spring Dance at the village hall was certainly an evening to remember. Tables covered with crisp white tablecloths and festooned with yellow and green helium balloons and ribbons, hosted over 100 people who enjoyed a scrumptious dinner, after which we were all treated to the largely '60s sound of Jim Balls and his Racquets (or is it Jim Racquets and his Balls, I can never remember..) who relentlessly strummed their way through virtually every recording featuring loud drumming that EMI ever produced. They made an exceptionally brave attempt at Oasis's 'Champagne SuperNova', and encouraged by the fact that no-one left, had a crack at U2s 'With or Without You' before moving mercifully back into their comfort zone of some more loud drumming. Nonetheless, the dance floor remained practically full for most of the evening so hats off to Jim and his band, they do know how to play a good gig ! A raffle followed a brief break in the drumming, during which the Chairman's wife won first prize (always happens; I think next time we'll just deliver the top prize to their house beforehand to save the hassle of bringing it down to the hall), before it was back to Jim's big band to close off the evening with some nice romantic slow numbers, with lots of drumming. I can't close this week without mentioning that stalwart of British tennis, Greg Rusedski, who announced his retirement from the professional sport this week. He spent 12 years playing for Great Britain and reached a career best of being ranked number 4 in the world, as well as holding the fastest serve record for some years at 149mph, only recently beaten by Andy Roddick. Clearly our own Roy Cook's serve has never been officially measured on our courts, because that would certainly take the new record; I'd estimate his first serve must reach over 500mph but unfortunately they very rarely go in, and his second serve is around 4mph, so if you manage to avoid being hit by his first serve, which would almost certainly be the end of you, then you can watch him play his second serve, nip off for a cup of tea in the clubhouse, take the dog for a walk around the field and meander back to the court all in time to see the ball lethargically approaching the point where you may have to consider hitting it back. Games with Roy aren't rapid affairs. Mind you, my second serve is even slower, and we're purposely kept apart in the competitions because of the requirement to finish a game in the same week in which it was started. For those interested in trivia, the longest singles match in recorded tennis history took place at the 2004 French Open when Fabrice Santoro defeated Arnaud Clement 6-4; 6-3; 6-7; 3-6; 16-14. The match lasted for 6 hours and 35 minutes of actual play, and was spread over 2 days due to it getting dark at the end of the first day! For any further information about the club, including when we get together for our social tennis sessions up at the School Lane courts, or our various activities, please contact Chairman Ross Bagni. Lunches will be served from 12noon until 2.00pm. and there will be various stalls and side shows to make a Fun day for all ages. The proceeds from the day will be shared between The Chernobyl Children Life Line charity and Chapel funds. Do join us, we can promise a tasty lunch, in lovely gardens, lots of fun, ample parking in the grounds and a very warm welcome. For further information please see Chapel members. Sunday 13th May at 10.30am Sunday School Anniversary Family Service to be taken by Dr. Roger Owers with the help of our young people. Saturday monthly Lunches will resume on October 13th from 12.00 until 1.30pm. We are unable to serve lunches during May, July, August and September due to holidays, our apologies to our regular supporters. We look forward to seeing you all in October. Following last year's wonderful day exploring the gardens of Eaton Bray, Edlesborough and Northall it is time to start preparing for this year's event. Once again various garden owners and allotment holders have been kind enough to agree to open their gardens for our delight, with more from Edlesborough than there were last year. The money raised will be shared between Chilterns Multiple Sclerosis Therapy Centre and St Mary's Roof Fund. There will be tiny gardens, huge gardens, gardens for picnicking, gardens to admire, water features ranging from small ponds to lakes. Please get the date in your diary and purchase your Roving Programme tickets when they become available in early June. At this stage the organisers are keen to receive offers of help from Focus readers. If you would like to contribute to this very special day please contact Gordon Gray. We guarantee a whole day of fun and entertainment for everyone on Edlesborough Green so be sure to invite friends and family to come along. Full details of the big day will be published in your free guide to our carnival which will be distributed next month with Focus magazine. We will have a goods collection day on Sunday 10 June at Edlesborough Hall from 12.00pm - 2.00pm where you will also be able to buy plants and have tea as part of the Open Gardens Event. No bulky furniture or junk please: we're looking for good quality items which are saleable. Your kind donations can help us meet the challenge of raising money for local good causes. An Order has been made which will temporarily prohibit any vehicle from proceeding, except for access, in that length of the A4146 Leighton Road, Northall in the Parish of Edlesborough, which commences at its junction with Slapton Lane and continues to its junction with Eaton Bray Road. The alternative route for vehicles affected by the closure will be via A505, B488 to Ivinghoe, B489 to Edlesborough and A4146 and vice versa. The alternative route for Heavy Goods Vehicles will be via A515, A5 and B489. The closure is required whilst carriageway resurfacing works take place and it is anticipated that the works will take place between 1900 hours on 30 May 2007 and 0600 hours on 1 June 2007. The Order will come into operation on 30 May 2007 when the appropriate signs are lawfully displayed and will continue in force for a period of 18 months or until the works have been completed, whichever is the earlier. 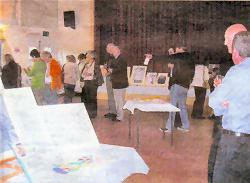 Work by new artists was a real draw at a special private viewing in Eaton Bray Village Hall. The artwork was created by adults on a new course, called Art'scool, held at the hall. Tutor Christine Gallagher was delighted with the work produced by students on the 10-week course, which was aimed at beginners. Christine, who lives in Bower Lane, Eaton Bray, has drawn and painted for many years. She decided to set up Art'scool after hearing people complain that they couldn't draw or that they hadn't been encouraged enough in art at school. Christine said: "There seems to be a lot of adults saying that, although they'd love to try, the opportunity to learn never seems to arise. "That's why I started Art'scool, as I believe that, given the right encouragement and a willingness to learn the basic techniques, everyone can learn to draw and unleash their creative side." She was really impressed by the students' work. "I'm amazed, really," she said. "I didn't think that they would produce the standard that they did. their work at a private viewing. "It just goes to show that people really can learn. You can't teach people talent, but you can certainly teach them the techniques, and then the confidence comes from there - and I suppose the creativity comes out of the confidence." Christine has received letters from people who took part in the course, saying how much they enjoyed it. She said: I am going to be running the courses again in June, and can offer daytime or evening sessions for anyone who wants to come along and learn." The hotel Nova Paradise may have seen better days, but it's still a home away from home for the long-stay British pensioners wintering in Majorca. When the arrival of a young couple, booked into the hotel by mistake, coincides with a near-riot by hotel staff, the many layers of deceit peel away with increasing speed. The play runs the gamut of human emotions, striking a fine balance between comedy and poignancy. County council spokesman, John Pilgrim, said: "We all know that exercise is good for us but there's so much conflicting advice around about how best to keep fit that it can be confusing. But nothing could be simpler than joining a few friends on a good walk through the Bedfordshire countryside. "Research shows that taking a walk is good for you and taking that walk along with a group of friends through pleasant surroundings is a real bonus." To find out about walks in your area, visit the website at www.walk4health.org, or telephone healthy walks manager, Liz Millbank, on 01234 762605. Mr Pilgrim said the council's countryside access team has also produced a number of leaflets which contain information on some stunning walks in the county. County council cabinet member for community services, Cllr Bob King, said: "The great thing about keeping fit through walking is that you can do it at your own pace and so those 30 minutes a day that we should all spend walking can also be split up into short 10 minute pieces while you build up your fitness. "There are also ways that people can keep fit and help the community at the same time. Why not offer your services to one of the teams who work throughout the county on conservation projects? They will be pleased to hear from you". Last year you may remember we were blessed with wonderful weather which caused me "King of the BBQ" to completely out sell the baked potato merchants (much to the disgust of a certain younger GI). Well, we can't guarantee the weather but we can guarantee you will get the best beer and food in Bedfordshire for the two days. The GI's really love to do this event as we often get asked by our beer friends to check if the beer is OK before it goes on sale. I don't know a lot about beer ("pardon" do I hear you say) so I have to try quite a lot just to check all is fine before we let the you good folk in to buy some. So if the BBQ is on the slant please don't blame me, it is merely your own consumption causing this optical illusion. More information available from the Village Hall Events page. Last month a kind person reminded me that Christian Aid Week was due soon and doesn't time seem to fly! To start the week, there will be a Churches Together service, at St Mary's, Eaton Bray on Sunday 13th, May, at 4pm and all are welcome. The new event, this year, will be a concert by young people from Edlesborough School and St Mary's Church. This will take place at St Mary's, Eaton Bray, on Wednesday, 6`h June at 7.OOpm. More details later! Please don't forget to support us. Thank you all for a magnificent response last year. We collected a fantastic £3,467! Can we break another record this year? South Bedfordshire District Council would like to say a big THANK YOU to all residents as recycling rates continue to rise. The district is now recycling over 29 per cent from the kerbside recycling scheme and the recycling facilities located throughout the District. This is a huge increase from 7 per cent recycling rate in 2002/3. We are sure all residents taking part in the scheme will keep up the good work. We cannot go on burying our waste in the ground forever and landfill space is running out. Landfill sites release harmful gasses into the atmosphere, which is a contributing factor to climate change. Through recycling, reducing and reusing we are able to reduce the amount of waste taken to landfill, therefore reducing the potential of polluting your natural environment Recycling and using recycled products also reduces the amount of natural resources being extracted. How you can do your bit? Use the kerbside orange bag recycling scheme. Shop smartly - buy products in packaging you can recycle. Re-use your carrier bags at the supermarket. A plastic bag can take 500 years to break down at a landfill site. Use the recycling facilities located throughout the district. Schools are now also able to join the recycling scheme, so sign up now! Recycling has never been easier, with many items being collected through the kerbside scheme. By separating your waste and placing recyclables into the orange bag you too can help. The greens v the rats - who'll win? A magnet for vermin or an intelligent way to get people recycling? The great bins debate has been rumbling on again, and with bin collections back in the headlines, people up and down the country have been talking rubbish this week. More than 140 councils have already scrapped weekly bin collections in favour of alternate weekly collections, and South Beds District Council is set to follow their lead later this year. From September 3, householders in the district will have their black bins emptied one week and recyclables picked up the next. It's been dubbed a way of reducing the amount of rubbish going into landfill, and the council claims recycling rates are set to rocket. But when the decision was announced last September the Gazette was inundated with angry responses from taxpayers. This week the district council confirmed that there are no plans to extend kerbside glass collections, so many recyclers will have to continue taking glass to bottle banks. Since the council's executive committee decided to scrap weekly bin collections, a lot of the talk has been on whether leaving rubbish in bins for longer poses health risks. An investigation by the News of the World has claimed that levels of "dangerous organisms" found in bins rise dramatically if rubbish isn't picked up for a fortnight. But the paper also pointed out that research has also shown two-weekold waste is safe if it's wrapped up properly. This week South Beds District Council said that so far feedback from the public has been "minimal and mixed". And a spokesman said: "While some residents have expressed concern about the issue, once it is explained to them, most appreciate that it will lead to improved recycling rates and that it is necessary if the council is to avoid landfill taxes. "The experience from other councils is that the introduction of an alternate week collection service does not result in any increase in rodents or insects, provided people wrap their food waste safely and securely, and store it in their black-wheeled bin with the lid closed." People living in flats with communal bins will continue to have their rubbish picked up weekly, the Gazette has learned. The district council is set to spend around £600,000 rolling out new orange recycling bins and mounting an education campaign. This money comes from a local area agreement grant from Beds County Council. Two national newspapers, including the News of the World, have mounted campaigns against alternate weekly collections. It's been one of the big talking points ahead of local elections across the country tomorrow, but it's not one that divides easily along party lines. Councils controlled by all the major parties have switched to alternate collections. Among these is neighbouring Mid Beds, where the district council claims that the project has been a success. More than 15,000 tonnes of household waste were diverted from landfill to be recycled, and the recycling rate doubled between April 2005 and March 2006, according to Mid Beds District Council. And research by the Local Government Association (LGA) suggests that areas where rubbish is picked up less often have higher recycling rates. "For decades people have been used to being able to throw their rubbish away without worrying about environmental consequences or rising costs. "Those days are now over." Property developers with ambitions to build vast housing estates on the northern and eastern edges of Leighton Buzzard could soon see their hopes confirmed. But on the other hand it is equally possible that Leighton-Linslade might be completely spared from massive further development beyond what is already in the planning system pipeline. It all depends a lot on what the public tell councillors during a major initial consultation due to start in a month or two's time. If a large majority of people in the town and nearby villages present a strong voice against thousands more homes being added to Leighton's allocation up to 2031, it should have a big influence on the decisions that follow. The yellow patches are the maximum potential areas where councillors think new building could be allowed: Click image for full sized version. A new draft council document indicates that it could still be a realistic aim to place most or even all of the 37,000 new south Bedfordshire homes demanded by the government in Luton and Dunstable. Ten possible options for building in the district during the coming 24 years have been proposed in a 44-page document called the Core Strategy - Draft Issues and Options Paper. This includes background information, discussion about transport, jobs, the role of town centres and the need for community facilities. The Core Strategy is the first fundamental step towards detailed zoning of land for new development by a committee made up of district, county and Luton councillors. This Joint Planning and Transportation Committee includes representation from Milton Keynes and others involved in implementing the Milton Keynes and South Midlands Sub-Regional Strategy. The committee is working at this stage to decide in outline where the development should go, so detailed planning of estate roads, factories and health centres is well in the future. 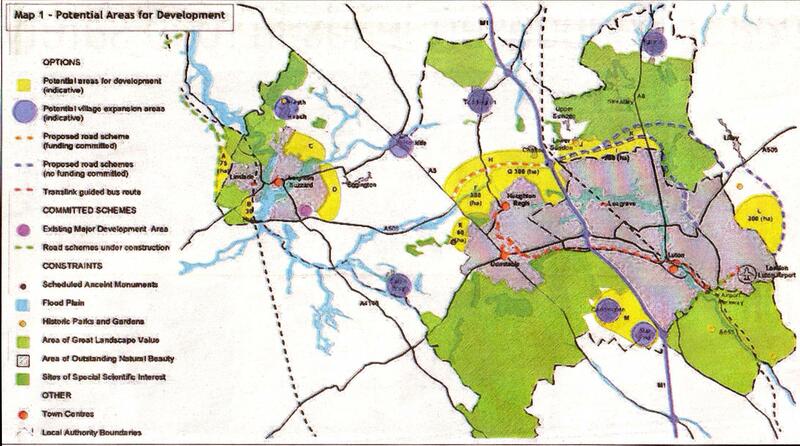 But although the core strategy only talks about ''five possible alternative approaches to how the development could be distributed'', it is highly important in showing the areas that the committee is interested in considering - and for showing the areas that are not in the frame for rolling back the green belt. Development limited to within the bypasses. 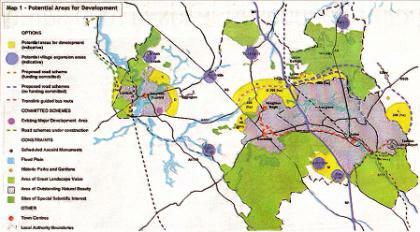 Development not limited to within the bypasses. Maximise proximity to town centres and main employment areas. Each of these is also depicted with minimum and maximum areas of land being allocated for development, depending on the density of housing per acre that is finally decided on. Densely-packed blocks of flats could obviously provide homes for more people in a smaller area than larger houses with gardens and this would have a direct impact on the amount of green belt countryside that will have to be built on to achieve the government's required total. But social factors also need to be considered and final announcements could be two years away. The land between Derwent Road, and the new Linslade Bypass, bounded by Soulbury Road to the north. An arc of land wrapping round the eastern side of Leighton from Cotefield Drive and Heath Road in the north west to the A505 Leighton Bypass in the south. This area is bounded by Shenley Hill Road to the north and stops short of Eggington in the east, but is broken in two by a gap for the Clipstone Brook flood plain. It includes most of the land proposed for future development by a local consortium of land-owners and builders, as exclusively revealed by the LBO last year, if they are allowed to proceed. n A 30-hectare strip beside the railway line between Wing Road, on the southern edge of Linslade, and the Leighton Bypass, but not extending up Wing Hill. General development in the villages of Heath and Reach, Eaton Bray, Hockliffe, Barton, Toddington, Caddington and Slip End. Five of the ten options do not propose any extra development around Leighton-Linslade, confining it all to extensions of Luton, Dunstable and Houghton Regis. Objectors who fear that Leighton couldn't cope with thousands more homes and are sceptical about sufficient infrastucture being provided will take heart from this and drive home their case when the Core Strategy questionnaire is made available to the public. Only one option - "Widespread development, maximum land-take" - suggests allowing development in Heath and Reach, Hockliffe and Eaton Bray. Heath is certainly expected to oppose this idea forcefully, having just reported in its newly-published Parish Plan that 92% of residents voted against any changes whatever being made to the existing green belt. Stanbridge, Tilsworth, Eggington and Billington are not being mooted for inclusion in the development areas. You can view and download The Core Strategy Draft Issues and Options Paper on http://agendas.luton.gov.uk/cmiswebpublic/binary.ashx?Document=11439. You are viewing the May 2007 archive.